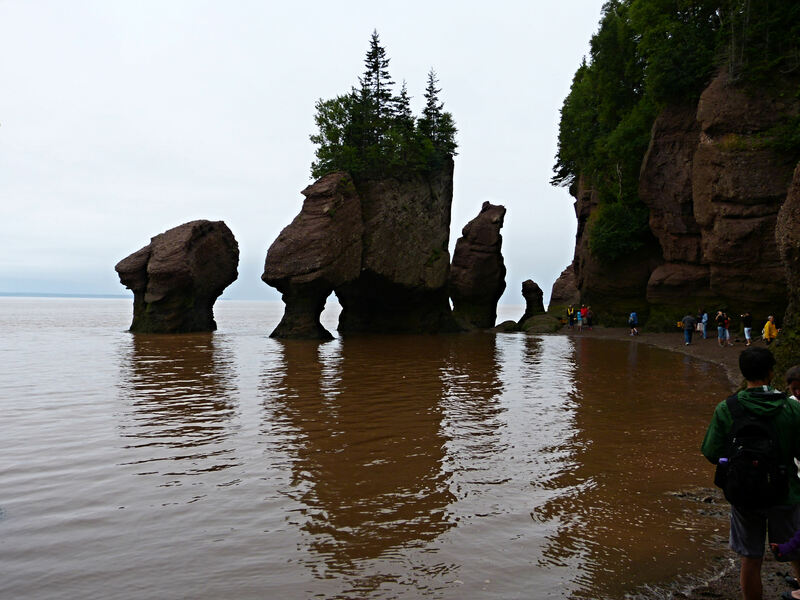 The tide goes up 48 feet at this location on the Bay of Fundy. We visited the Rocks in Hopewell, catching it as the tide was incoming. 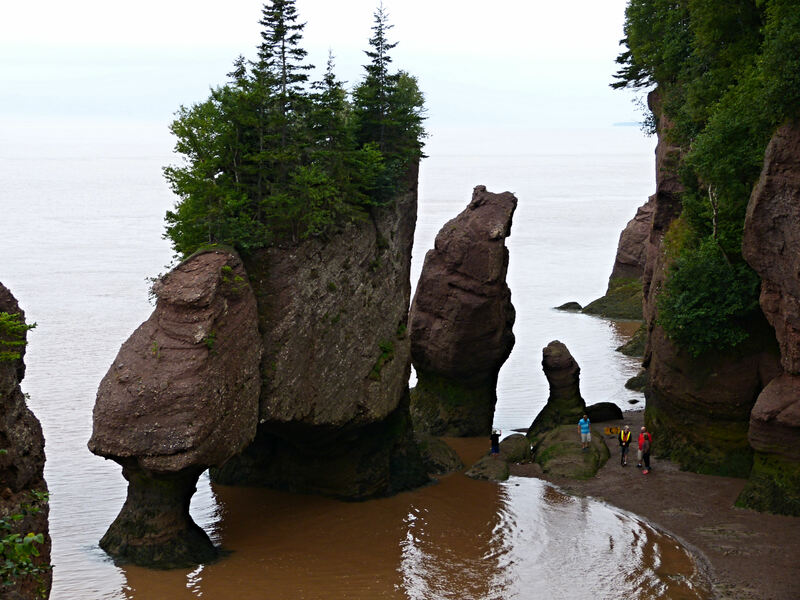 This is one of the most impressive spots to view the amazing tides in the Bay of Fundy. We also visited Cape Enrage, but the heavy rain and fog deterred us from venturing far afield. We have noticed that the Bay is foggy most mornings, and when it rains it is foggy all day. 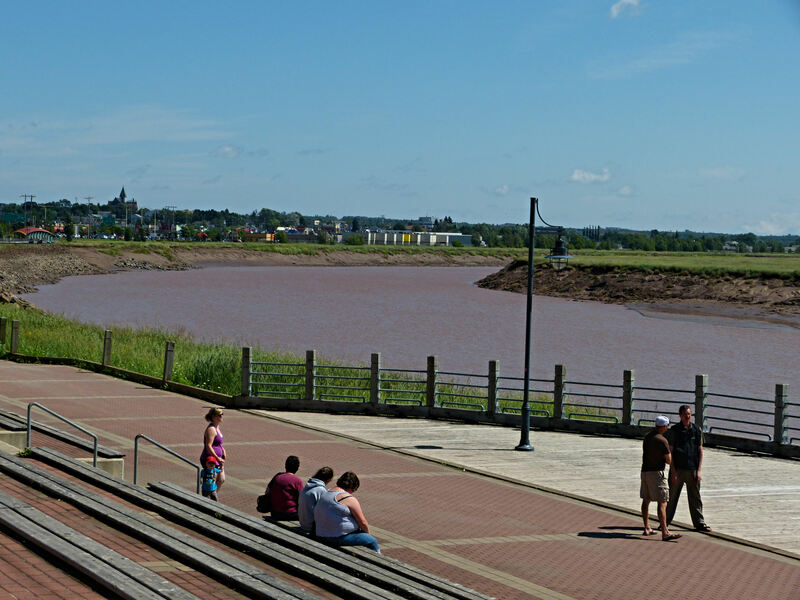 On Sunday we traveled to Moncton to view the Tidal Bore. We watched as the river in front of us went from flowing peacefully in one direction to a huge wave coming down the river and all of the water changing direction and flowing rapidly in the other direction. I don’t think I have explained it clearly, but it truly was an amazing thing to see! People waiting for the tidal bore to arrive. The river is a clay red in color. As it was our last day at Fundy National Park, we made the most of it and visited the Wolfe Point area and Herring Cove beach. Charlie managed a short hike, I may have mentioned he sprained his ankle our first day of vacation and we have been taking it easy on the hiking so that it can heal before we get to Cape Breton and Gros Morne. Herring Cove Beach was beautiful, and we really could have spent an entire day there instead of just a late afternoon visit. 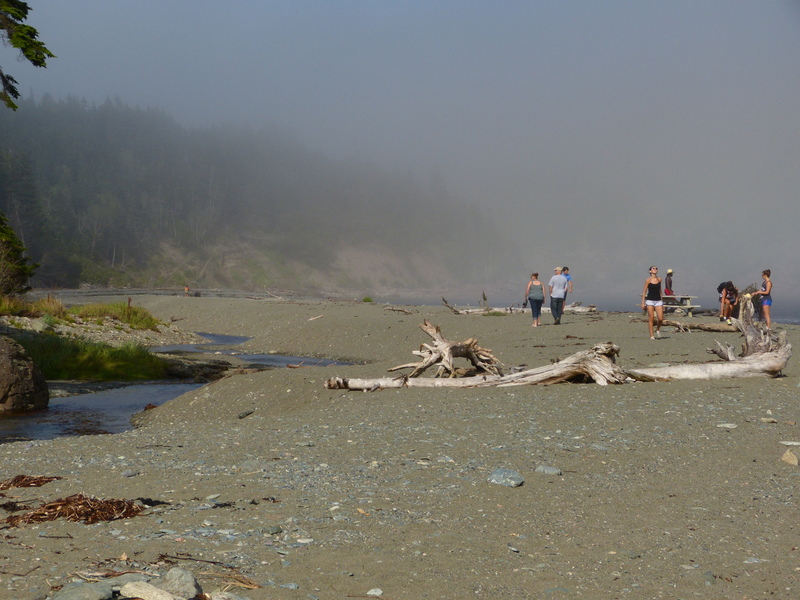 Herring Cove Beach at Fundy National Park. 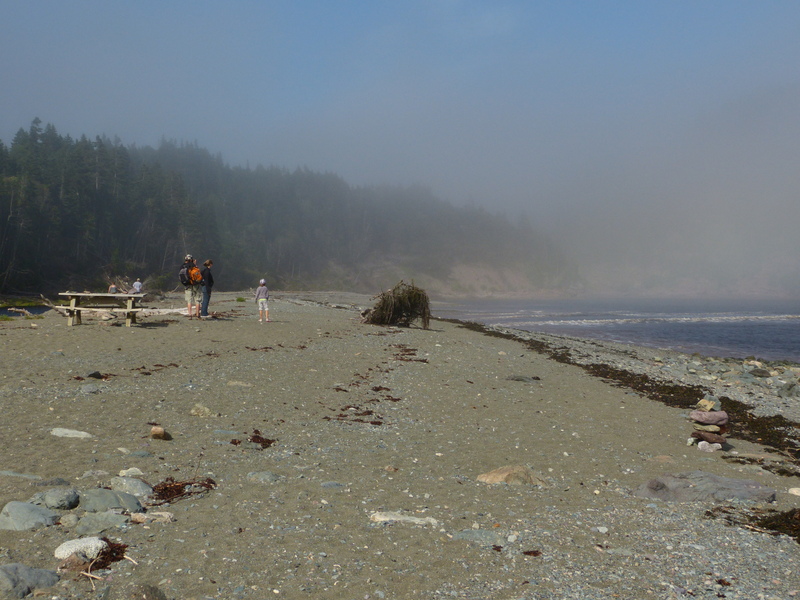 Note the fog even though it is late afternoon at Herring Cove on the Bay of Fundy. This entry was posted in Uncategorized on August 11, 2013 by Ramblin' Rose. Thrilled to read that you saw the tidal bore! I think you were the one who suggested it. It really was cool to see. Lots of interesting birds up here, too. Those rocks are so cool! Al and I traveled some of the areas about which you write, Sara; Bay of Fundy Tides, Tidal Bore, etc. One year we were all set to watch for the Tidal Bore at the approximate time but were told by some of the natives that it was not as exciting as some times due to what I don’t recall. Your picture looks just like where we sat waiting, not willing to believe what we were told. Finally this tiny ripple came around the bend. That was it? Yes, that was it for that particular day and time. It was actually pretty funny! Enjoying all your pictures and accompanying blog. This part of your trip brings back happy memories. I really enjoyed your photography! Thank you!!! We haven’t been traveling much lately, but hope to get moving again soon.